A collapsed road is seen following torrential rain caused by typhoon Lan in Kishiwada, Japan in this photo taken by Kyodo on October 23, 2017. TOKYO - A rapidly weakening typhoon Lan made landfall in Japan on Monday, setting off landslides and flooding that prompted evacuation orders for tens of thousands of people, but then headed out to sea after largely sparing the capital, Tokyo. Four people were reported killed, hundreds of plane flights canceled, and train services disrupted in the wake of Lan, which had maintained intense strength until virtually the time it made landfall west of Tokyo in the early hours of Monday. At least four people were killed, including a man who was hit by falling scaffolding, a fisherman tending to his boat, and a young woman whose car had been washed away by floodwaters. Another casualty was left comatose by injuries and a man was missing, NHK public television said. Around 130 others suffered minor injuries. 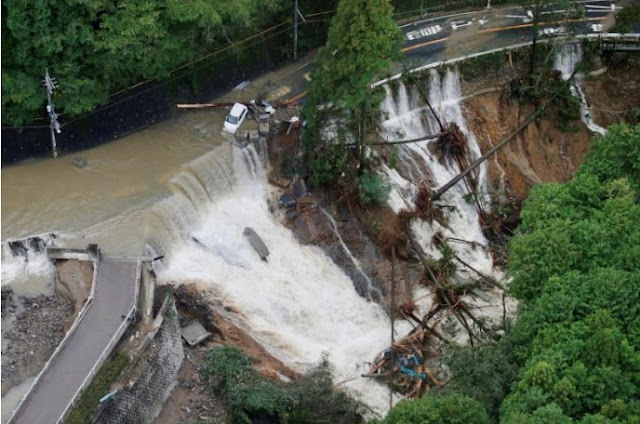 Rivers burst their banks in several parts of Japan and fishing boats were tossed up on land. A container ship was stranded after being swept onto a harbor wall but all 19 crew members escaped injury. Some 80,000 people in Koriyama, a city 200 km (124 miles) north of Tokyo, were ordered to evacuate as a river neared the top of its banks, NHK said, but by afternoon water levels were starting to fall. Several hundred houses in western Japan were flooded. “My grandchild lives over there. The house is fine, but the area is flooded, and they can’t get out,” one man told NHK. Lan had weakened to a category 2 storm when it made landfall early on Monday, sideswiping Tokyo, after powering north for days as an intense category 4 storm, according to the Tropical Storm Risk monitoring site. Lan is the Marshall islands word for “storm”. Around 350 flights were canceled and train services disrupted over a wide area of Japan, although most commuter trains were running smoothly in Tokyo. Toyota Motor Corp canceled the first shift at all of its assembly plants but said it would operate the second shift as normal. A rapidly weakening typhoon Lan made landfall in Japan on Monday, setting off landslides and flooding that prompted evacuation orders for tens of thousands of people, but then headed out to sea after largely sparing the capital, Tokyo.